India’s growing fascination with flowers has translated to an unprecedented boom in the domestic floriculture industry. According to the data available with the Agriculture and Processed Food Products Export Development Authority, the floriculture industry in India has recorded a 20 percent annual growth in exports over the last decade. Hydroponic Culture: Where flower saplings are planted in pots with saw dust, coco-pit or sand instead of soil. There are a host of course options dedicated exclusively to floriculture available across agriculture universities in the country. These range from basic certificate courses, diplomas and even specialisations at Masters or PhD level. However, there are very few undergraduate courses dedicated to this stream exclusively. 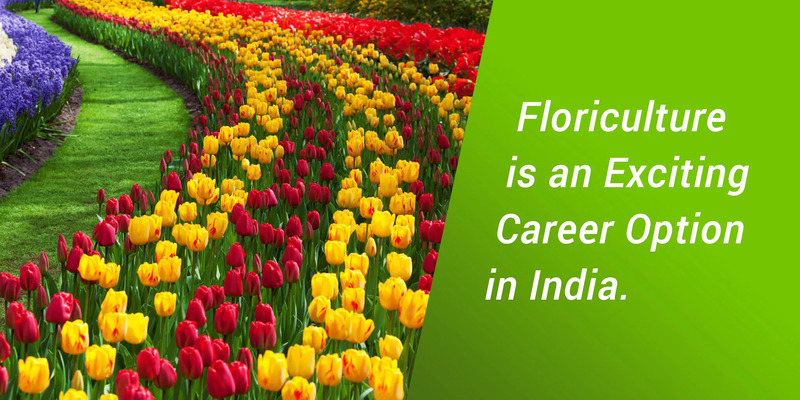 In most colleges and universities, floriculture is forms a part of the curriculum for agriculture studies at undergraduate levels. An undergraduate degree spans three to four years, MSc in floriculture is a 2-year course, where as certificate and diploma courses have varying durations decided by individual institutions offering the course. For undergraduate courses, having Botany as one of the subjects in Class 12 is a pre-requisite, so the course is open to medical students. Most colleges and universities also conduct an entrance test for admission. For MSc in Floriculture, aspirants are required to clear the All India Entrance Examination conducted by Indian Council for Agriculture Research. Besides, some universities, such as the Jawaharlal Nehru University in Delhi, carry out their own entrance tests for Master’s programme as well. Besides these inherent personality traits, you also need to work on your communication and marketing skills to be successful in this field, as it is a service-oriented work profile that entails regular interaction with customers and suppliers. Floriculture Units: This involves working at the ground level and being involved with growing the plants. The job profile entails pruning, watering, fertilizing, harvesting, and finally, shipping the plants. Landscaping: As a landscaping expert, you can be associated with consultancy firms that offer their expert services to architects and builders working on high-end construction projects. The job profile entails chalking out and executing a plan for landscaping green spaces around residential or commercial properties, and may also, extend to looking after their upkeep and maintenance. Perfume and Cosmetics Industry: A lot of premium perfumes draw their fragrance notes from actual flower extracts. Similarly, flower pigments, essential oils and nutraceutical compounds are used extensively in the cosmetic industry. As an expert in floriculture, you can be hired to oversee and manage these processes to ensure quality checks. Export Business: Of course, since maximum returns in this sector come from exports, you can consider setting up your own business venture, catering to domestic as well as global markets. During occasions such as Christmas and Valentine’s Day, the global demand for flowers is through the roof, and that window itself is good enough for you to rake in big profits. How to Get Scholarship in India?